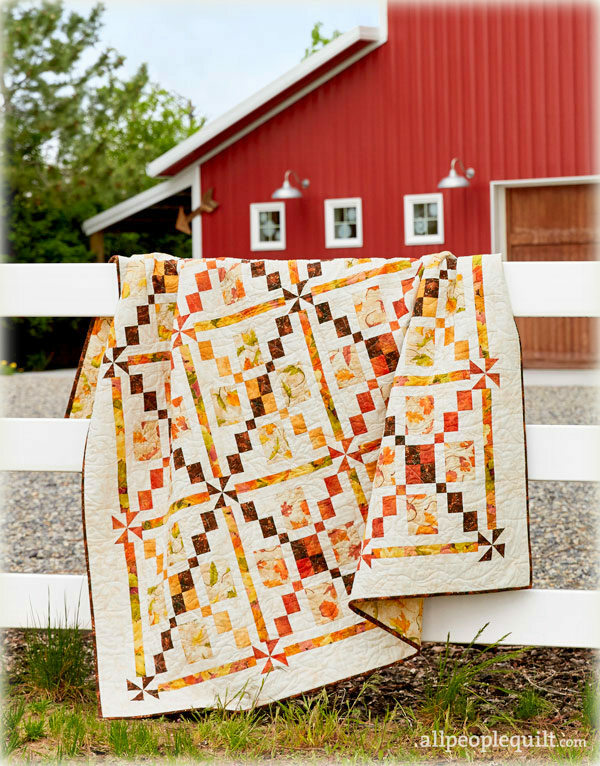 This entry was posted in Quilt Pattern, Quilting, Quilts & Projects: Published, Quilts: Pieced and tagged Autumn Quilt, Fall Quilt, Quilts and More Fall 2017, RJR Fabrics, Wendy Sheppard Designs. Bookmark the permalink. Congrat’s on your quilt being featured. It is lovely and does make me think of warm cinnamon goodies. Your new quilt is lovely, Wendy. I agree, it is a great fabric collection. Fall is my absolute favorite season–love the colors, cooler temps, and most all, LEAVES! By the way, it’s a good thing Miss Bay can’t see my fabric stash–who knows what kind of comments it would elicit! She cracks me up. We would never loose faith in you Wendy! 😄. Love that Cinnamon Swirl…I will be sure to pick up the Quilts and More magazine. Beautiful quilt! I don’t mind fall. But I don’t get excited about it because I know what comes next! Hello Wendy, Your Cinnamon Swirl Quilt is “yummy”….LOL…I could not resist! Seriously though, it is really beautiful with all of those brilliant fall colors. 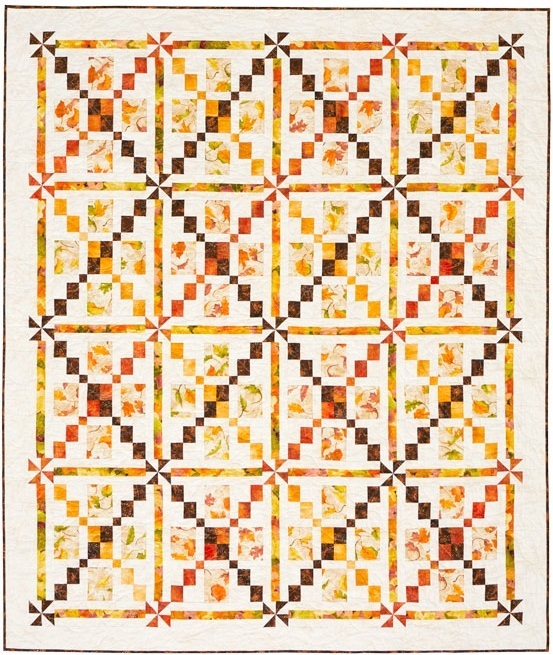 I hope I will be able to find a copy of the magazine in town, I would love to make this quilt for my Mother. Boy, I sure was sorry that I missed out on your “Help-Me-DeStash” project !!! We have been dealing with a lot of bad health issues in our family. Reading and responding to my favorite blogs has become almost non existent. If for any reason you decide to continue due to Miss Baby’s recommendations I would love to be placed on the waiting list! But also totally understand missing out also! I still always smile that you were the first one to follow me once I began to try and blog once again! It made me feel so wonderful. I am still struggling terribly to get it up and going, but hope someday to run a good blog! Thank You so much for all that you share and do for us, you fill this quilting world with great feelings of happiness and wonderful quilts that make the world a better place because people know someone loves them when they snuggle in a quilt! Quilt Patterns you design and share so often for free that quilters can make into quilts for Project Linus, Quilts of Valor and so much more…..Wendy you are a superb woman of this world and I thank the Lord he gave you to our quilting world! Have a spectacular day! Loving your Cinnamon Swirl, but I must admit the title makes me hungry….giggle. I like everything about this quilt, Wendy. The colors and design are just fabulous and I love the chain that snakes through the design. Cinnamon and autumn just go together. Our days are definitely shortening. Cinnamon Swirl is a beauty………..oranges, rusts, etc. are usually not my colors. This one is special. It is beginning to be Fall here in Middle TN also. Mornings are a bit cooler, leaves are beginning to flutter from the trees, and there is just “that feeling.” Bet that you are feeling the weight off your shoulders now that you are “de-stashig.” Such a glorious feeling. Cinnamon gets used year round in my house, we love it on our oatmeal. Yup, oatmeal is a year-round favorite too! I am amazed that you could let go of that much fabric! Wow! Now that is a determined destasher! Now if you ever want to destash your pile of quilts, put me on the list!! Ha! Ha! I’ve been quilting for almost a year and a half but I’ve given away or sold everything I made! My house is crying out for quilts! I’m sure I’ll eventually get some made for me. I love the smells of fall and all the baking. The quilt is yummy, I love it and I love cinnamon anything! That’s a nice setting for your Swirl quilt. Sounds like you are making some good progress in “sharing” your stash! Congratulations! That does look cinnamony! 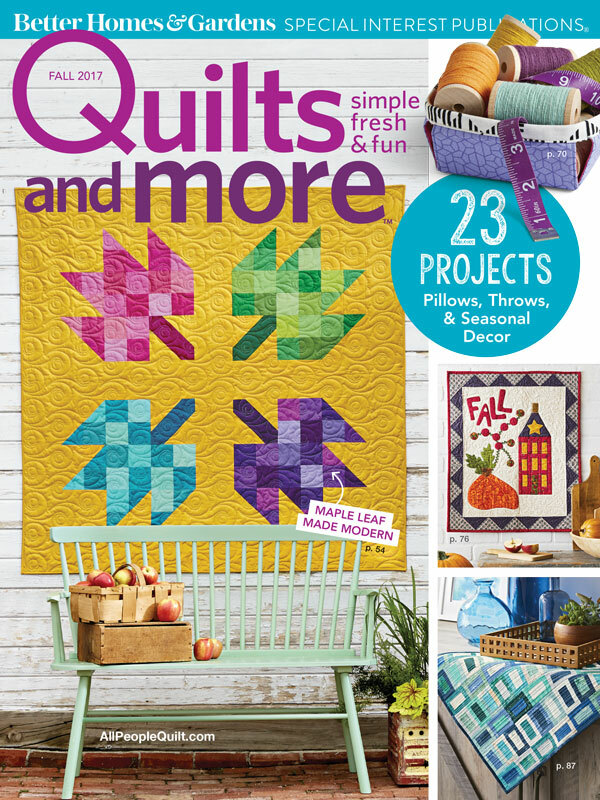 Just saw this quilt in the magazine and knew immediately that it was your design!! Sorry I missed your de-stashing post! A few years back you posted about some cabinets that you had made for your fabric, after de-stashing will everything fit in them? Keep Miss Baby’s comments coming. She has quite the sense of humor! Is it safe to assume that things are never dull in your household? Love the fabrics!!! Am I too late to get in on the de-stashing fabric?? Would love any hand-me-downs you have extra! You are still my favorite quilter, dear friend!